Big Ears provides shelter, care, rehabilitation and in some cases re-homing to animals that have been abandoned, mistreated or abused. Big ears has approx. 500 animals in it's care including pigs, cows, donkeys, sheep, goats, horses, dogs, cats, rabbits and cockatoo's. All money raised goes directly to the animals as no humans are paid at Big Ears. Listen up! This is your big chance to change the world. I’m serious! We are on a mission! Do you ever feel powerless to affect change?? You have more power than you think. Take the power back with the choices you make. It’s the small choices that make the big differences, to animals, people and the planet. We are hoping to raise $10,000 before the end of the financial year to help us continue the work we are doing for animals. 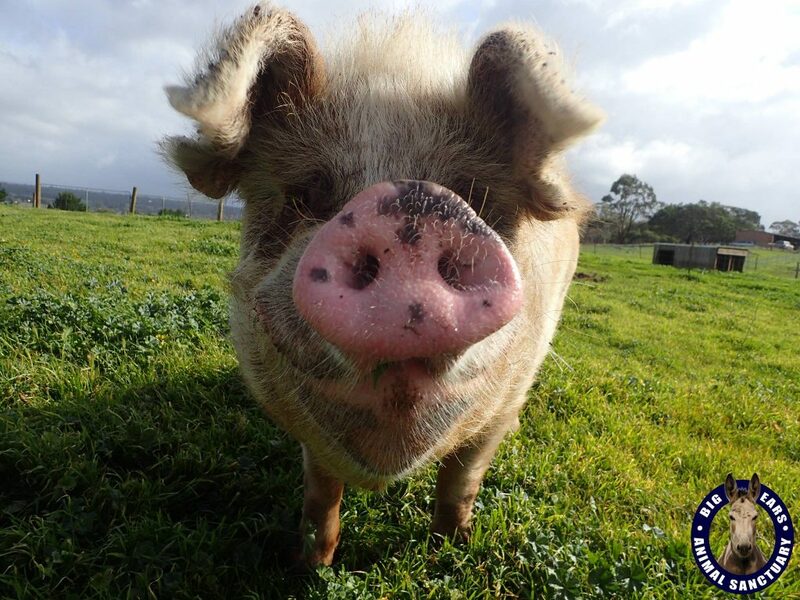 Not only do we need to feed the sanctuary animals over winter at a cost of $1000.00 a week, we also want to develop education programs and materials for our Education Centre to encourage people to make kinder, more compassionate choices. Imagine the difference we could make. This might be as simple as choosing plant based milk over dairy, donating the cost of a cup of coffee a week to an animal sanctuary or adopting an animal rather than buying from a breeder. Simply having one vegetarian meal a week could save up to 50 animals a year and 72000 litres of valuable drinking water. However we need your financial assistance to enable us to kick-start the education program while still providing the sanctuary animals with the gold class care they receive. Remember, we are one of only a small number of Sanctuaries where not one dollar is spent on wages. If 2,000 of you just donated $5 each we would reach our target. As you know all donations are tax deductible to our cause and given we are nearing 30 June, this is a great time for you to help. Please donate now to help make the world a better place. Never doubt that a small group of thoughtful, committed citizens can change the world indeed, it s the only thing that ever has. Be inspired by Margaret Mead today! Come on animal lovers! Let s make that target. Together we can do it! Really appreciate the work you all do. You inspire us all with your compassion and courage for those who can t speak for themselves. Because of you, the world is a better place. Thank you for the help you give to animals. Education is the key to fairer choices and lives changed for the better. What a worthy cause! Thank you for the amazing work you do and hugs to all the animals. Thank you for caring about animals. Need more people like you. Thanks for making the world a better and kinder place. From Lyra and Felix who care about the animals.